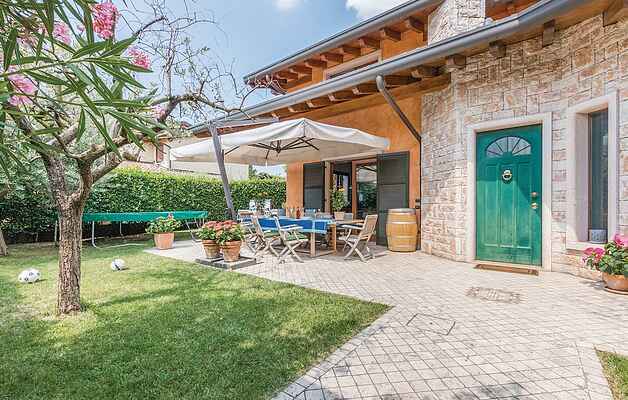 Beautiful holiday home with private pool and heated whirlpool in the heart of Valpolicella, in Veneto region. The house is the ideal place to spend relaxing days enjoying the great view over the surrounding vineyards. At guests’ disposal: an equipped garden for alfresco dining. The house is ideal for families with children and offers privacy thanks to the fact that the house is divided into several floors. Strategic starting point to visit the near city of Verona and the area. In summertime the Arena in Verona organizes a large choice of events (opera, pop music concerts) while at the Roman Theater you may enjoy ballets and music jazz concerts. We recommend to visit Lake Garda (less than 30 minutes driving) with its famous tourist site and amusement parks. Possibility for walking among the sweet hills around the lake and trekking on the Baldo Mountain. The area also offers thermal parks. The golf lovers may find some minutes driving 8 golf courts. Upon payment the owners organize for the guests wine tasting in the near Valpolicella, land of Amarone (red wine), and to buy wine. Possibility to book cooking lessons with famous cooks of the area who may also prepare dinner for you at home (upon payment). In this case you should reserve at least 4 weeks before arrival the cook.